If you are building a home gym, a power rack or a squat stand should be the second piece of equipment you get. First piece, of course, being a barbell and a set of plates. How does a power rack compare with a squat stand, as far as working out at home is concerned? Read the article and find out, or just jump to the conclusion to meet the winner of “power rack vs squat stand for home gym” showdown. Power rack takes the cake here for one simple reason: it has safety rails. When you’re lifting at a gym, rails aren’t that important. Most of the time, someone’s there to spot you. On the rare occasion when no-one’s available, you can afford to finish a set earlier. When you’re at home? You need safety rails. Sooner or later you’ll get pinned under the barbell for whatever reason. It’s not just about knowing your limits. You can’t count on always being able to avoid failure. You can be on a last rep of your 3RM set when your dog (or cat) bumps into you. Or someone knocks on your door, breaks your concentration, and you find yourself unable to finish the rep. Point is, things out of your control will prevent you from finishing a rep sooner or later. And when you can’t finish that rep and rack the bar, you’ll have to somehow dump it off. It might go fine the first few times, but eventually either your body, the barbell, or even you floor will get ruined. On top of that, the perspective of getting stuck under a barbell is scary. Mind plays a huge part in training. If you can’t concentrate on lifting the weight, you won’t be able to give it your all. And you won’t be able to concentrate when you don’t feel safe, constantly thinking “what if get stuck”. It’s simple, really: more safety – more gains. One final point: some squat stands come with adjustable safety rails. You can usually find a decent power rack for the price of a squat stand with adjustable rails, however. Power rack wins this one. You can do any free weight exercise when you have a power rack and an adjustable bench. You can use the rack to exercise with bands. You can use it for pull-ups, or install gymnastic rings on it. And expensive racks double as cable stations. Squat stands, on the other hand, only let you do a couple of exercises. Squats. Overhead presses. And that’s pretty much it. It can be enough for some, but most people at least want to be able to do bench presses. Of course, if you get better, more expensive, adjustable squat stands, you’ll be able to do bench press, and more. But again, expensive squat stands can cost as much as a power rack. Squat stands win here. If you live in a small apartment, they might be the only option. A power rack takes up a lot of space. It’s big and unwieldy. And since it holds the weight has the hooks on the outer pillars, you have to add radius of the plates to its footprint. This can take up additional 20cm. It also can prevent you from placing the rack near the wall. You can’t just get a tiny, narrow rack, too. Not enough space inside the rack means you won’t be able to do certain lifts in it. Things like cleans will be out of the question. You’ll have to do them outside, and that means you’ll need even more space freed up for lifting. Finally, even if you don’t plan on doing exercises that require space, a narrow power rack can be really claustrophobic. It’s not just about comfort – constantly minding the power rack pillars can mess with your technique. Plus bumping the barbell into a pillar mid-set can cause you to fail the set. Summing up, if you don’t have enough space to get a suitably big power rack, stick with the squat stand. Stability-wise, power rack and squat stands are about the same. Both are stable enough for most people, and most purposes. A squat stand, on the other hand, doesn’t need bolting. It might look less stable than a rack, but properly-designed stands are just as safe. And, of course, all bets are off for the DIY stands and rack. 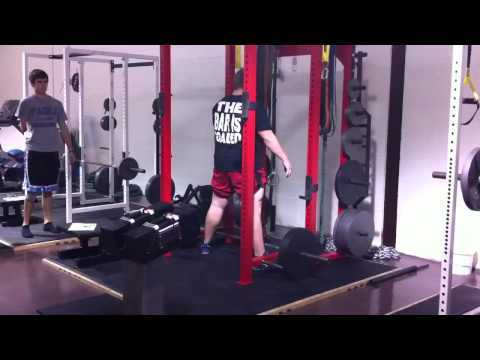 Bottom line: a squat stand is more stable than an unbolted power rack. A bolted-down rack is as stable as a squat stand. Squat stand is a clear winner here. Moving it from room to room or from house to house is easy and convenient. It can also be used just about anywhere, and you can put it away after you are done with your workout. Power rack, on the other hand, has to be disassembled and unbolted if you want to move it anywhere. Even then, its pillars are often long and unwieldy. On top of it, you need ample space to install and use the rack. This depends on where you are buying your equipment. New, a budget-tier squat stand is always cheaper than new, budget-tier power rack. Any other situation? Depends. A used, mid-tier power rack will be much cheaper than a high-tier squat stand. And unless the power rack is rusty and plain unsafe, it will be safer and more functional than the stand. On the other hand, it can become more expensive than the stands when you factor in the price of delivering the power rack. And don’t forget that you can make your own power rack or squat stands. Which, again, can end up costing you more than used ones. If price is your main concern, don’t look for a power rack or squat stands specifically. Look for the best deal. Conclusion: what wins a “power rack vs squat stand” battle? No space to put a power rack? Move often? Get squat stands. Don’t skimp on them. You need those safety rails if you want to be serious about your training. Can’t afford stands with safety rails? You didn’t hear it here, but sawhorses are better than nothing. Make sure you get sturdy ones. Have someplace to bolt down a power rack? Then the power rack is what you should get. Power racks are all-around better than squat stands. They are safer. They let you do pretty much every free-weight or bodyweight exercise. And you can find a good power rack for an amazingly low price. Whatever you decide to buy, make sure it’s appropriate for you. Squat stands should be just right for your height. Power rack hole spacing should be tight enough. You can work around bad measurements, but it’s best if your equipment is as close to being “just right” as possible. And one final piece of advice: before you buy a used power rack or used squat stands, inspect them in person. Make sure they are in good condition. Check that all parts are there, and function as they should. You don’t want safety rails that slip out or break when you dump a loaded barbell on them.